Stay conveniently when you visit or stop over in Gothenburg. It's easy to get to the city centre by car or Express bus. Swim a few strokes in our hotel pool, or just relax with a coffee by the open fire. If you don't want to rest in bed, you can always unwind in front of our open fire or challenge the family to a game of darts, table football or table tennis. In our restaurant, you can enjoy a good breakfast, lunch and dinner. If you are visiting us as a larger group and would prefer more private dinner seating, we can of course arrange this. We are well prepared for your conference at our hotel, thanks to our good food, equipment and capable staff. After a long day of activities you may need to unwind, and our relaxation suite will be waiting for you. We have a pool, sauna and gym. We are strategically located along the E6 motorway, only 5 minutes by car from central Gothenburg and 20 minutes by bus. Central Gothenburg has just about all you could wish for in a city, with shopping, cafés, restaurants and bars. Not forgetting the breathtaking rides at Liseberg and exciting adventures that await you at Universum science centre. Both the Albatross and St. Jorgen golf courses are within easy reach of our hotel, without the stresses of driving through town. 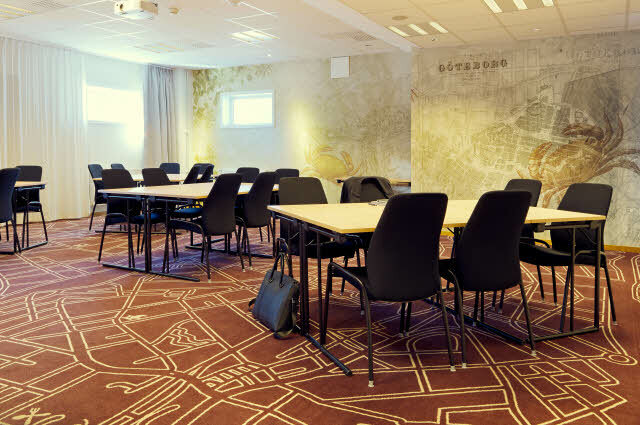 Our flexible conference department can help you arrange meetings and events for up to 200 people.